ICD-10, 10th edition, 2016 revision includes more than 100 edits, updates and clarifications from 1997 to the end of 2015. Other health problems with respect to variables, such as the characteristics and circumstances of the individuals affected. Further changes include a new code to document female genital mutilation, a range of emergency codes, and additional details for coding of antibiotic resistance. A flyer on how to fill in the medical certificate of cause of death. Volume 3 has been updated to match changes in Volume 1. For more information or to order by phone, please call 01603 69 6980 and speak to one of our customer service agents. ICD is used for health information purposes in public health, as well as primary, secondary and tertiary care settings. In particular it is used to classify diseases, accidents, reasons for encounter and other health problems recorded on many types of health and vital records, including death certificates. In addition to facilitating the storage and retrieval of diagnostic information for clinical, epidemiological and quality purposes, the resulting records form the basis for compiling national mortality and morbidity statistics by WHO Member States. 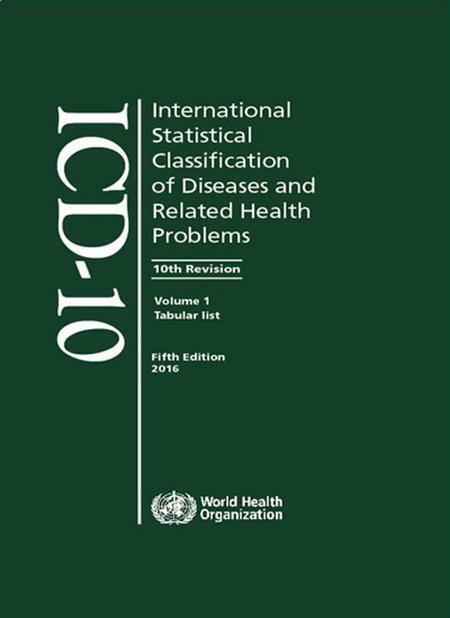 ICD has been translated into more than 40 languages and serves as a language-independent framework for classification of diseases. This title supersedes ICD-10 published in January 2012, ISBN 9789241548342.